Top-ranked American Mardy Fish clinched the 2011 Olympus US Open Series men’s title with a 7-5, 7-5, round of 16 win over Richard Gasquet at the Western & Southern Open in Cincinnati on Thursday (now that the field for the Winston-Salem Open, the final event of the Series – has been closed). This is the first Olympus US Open Series title for Fish, who finished third in the standings last year. The men’s second and third place finishers in this year’s bonus challenge have yet to be determined. 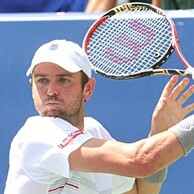 By winning the 2011 Atlanta Tennis Championships singles title, Fish got an early start on the men's field. The ATC is the first tournament in the series.